I am a happily married mother of 4 amazing adult children and nana to 2 energetic grandsons. In 1989 I was diagnosed with clinical depression, on and off medication for over 25 years. I was told that I would always suffer from this………. I live in a beautiful part of the world and get to enjoy the great outdoors almost every day. Daily, my hubby and I go for a walk, go to our local cafe for our morning cuppa and then have a swim. This is the start of our day and has been for years, yet I was unhealthy and unfit probably because I smoked and took antidepressants. By this time, I had been unhappy in myself for sometime and wasn’t really sure what to do about it? Then, when our first grandson was born in Dec 2011 I found I knew exactly what to do! On 1 Jan 2012 I quit smoking at the age of 52 after I had been smoking for 10 years!! (I started smoking in 2002 after I had a head on car accident) The money that we had spent on cigarettes was saved instead and towards our dream of a European vacation, which we took in 2013. After quitting smoking, more changes were on the way. When my youngest son turned 19 in June 2012 we had a family party where lots of pictures were taken. I saw a photo of myself from the back and did not know it was me!!! I had gained some weight gradually over a few years and I no longer recognised what my body looked like anymore! So what makes me different from anyone else? Nothing really, we all struggle with one thing or another, it is what we do about it is what makes us different. I could not believe how unhealthy I looked and I then realised I needed to take action. I do not want to get any older physically or mentally however it is inevitable!! I decided to take control on my health and change my lifestyle. I decided it is up to me to make the changes. I set out to improve myself physically and mentally so as to ensure I make the most of the years that I have left. Months after I saw that picture of myself, in March 2013 I began my transformation. I started by focusing on diet and nutrition. I wanted to be feeling better before we left on our trip to Europe in July so I bought Sarah Wilson’s “I Quit Sugar” book. Through what I learned in the book, I discovered I had an intolerance to gluten. With this discovery I also found that there could be a link to depression between the correlation of gluten and sugar. So this really got my attention as I was over taking medication!! I became more aware of looking at labels to check the sugar content. WOW!! It’s amazing to see what products have sugar in them? Nearly everything. 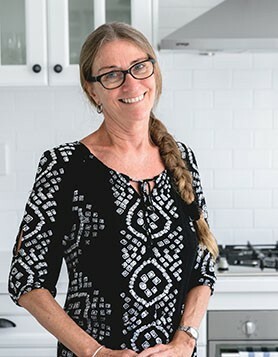 I also discovered a pocket rocket by the name of The Betty Rocker (aka Bree Argetsinger) around the same time and followed her approach to healthy eating by starting to make green smoothies/juice everyday. By the time we went on our holiday to Europe my husband and I had both lost 5kgs. So with the knowledge gained from Sarah and Betty we were able to enjoy ourselves, maintain our energy levels and not put on any extra weight. During the trip I also stopped taking my medication unbeknown to my Doctor. 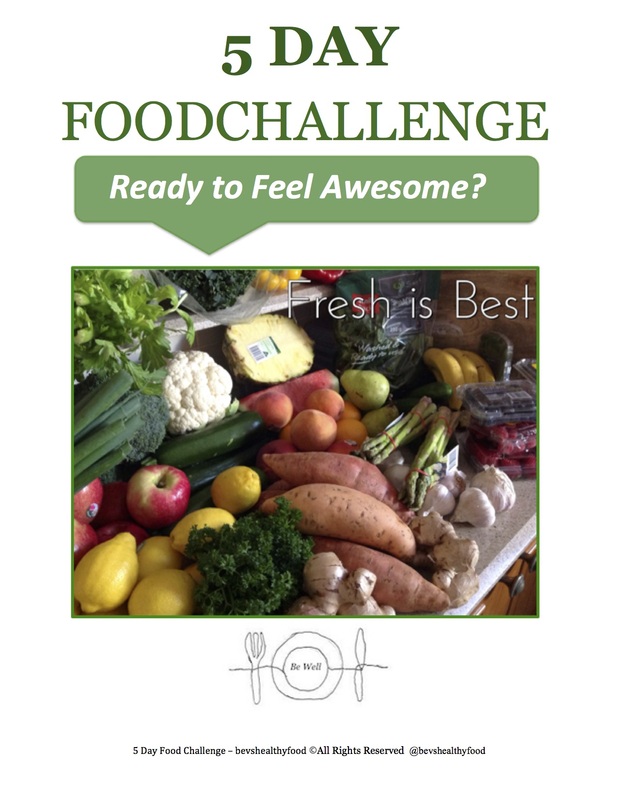 On 1 October 2013, I did my first Betty Rocker Fitness Challenge and also followed her Body Fuel System which gave me the knowledge and tools to feed my body with the fuel it deserves. There is a lot to be said about what we feed our body with. 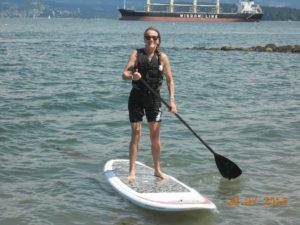 I have taken up Stand Up Paddle boarding which I absolutely love, not something I would have ever thought of doing! Now that my body is stronger and healthier, I can participate in such a strenuous activity. And also get to do this when we travel overseas! This photo is in Vancouver. I realised how much I loved learning about how our bodies respond to eating nutrient dense meals that fuel our bodies for maximum energy and vitality. I wrote my first e-book “Not Just Fresh Air”, a meal plan and guide that shares my transformation story. I always blamed my age as an excuse not do anything about my weight increase and lack of fitness. I now eat a lot differently, I eat whole foods, that are sugar, gluten & dairy free which my recipes reflect. This approach to my nutrition has seen me keep my weight down, have more energy, overcome minor illnesses (the cold) quicker and along with regular exercise I feel so much stronger. I have created this website so that I can share with you, my love of food and what I eat. It can be a massive challenge to eliminate foods and to find alternatives that are simple yet still provide the nutrients the body deserves and needs. Recently I furthered my knowledge by undertaking studies in nutrition. I studied with the Nutrition School and completed a Nutritious Life Certification and I still wanted to learn more. I found Cadence Health while searching where to study next. I completed The Certificate of Nutrition and Health Coaching and am now a Certified Nutrition, Health and Wellness Coach. So I continue today with my healthy eating and want to share this with you so that I may inspire you to make your best lifestyle choice. If you want to learn more about working with me CLICK HERE so that I can help you achieve your goals! Age is no barrier! and I hope that I can inspire you to live a healthier and fitter lifestyle.